WHEN approaching a roundabout always give way to your right. This is likely one of the first road rules that was drilled into you when you were learning how to drive. If this is the case then you have probably been driving wrong your whole life, because this common roundabout rule is actually a myth, one that could cost to up to $450. The actual rule dictates that drivers must slow or stop to give way to any vehicles already on the roundabout. A lot of the time the car you are giving way to will have entered the roundabout on your right, which is what may have caused this rule to become misconstrued. READ: Is this Australia's most obscure road rule? But you still have to wait even if the car is directly across from you, in the case of smaller roundabouts, to your left so long as they enter the roundabout before you do. 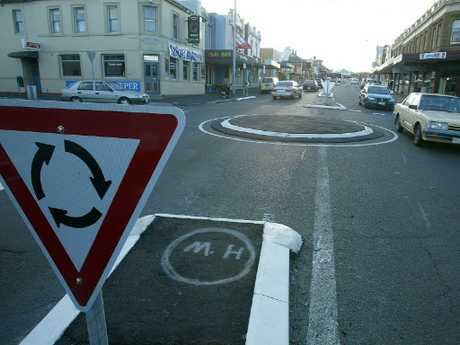 A spokesman from NRMA, Peter Khoury, told news.com.au that waiting for cars on your right if you get to the roundabout before them can impact the traffic flow. "We are not quite sure where this misconception comes from," he said. "If people approaching the roundabout are unnecessarily giving way to all cars coming from their right then it impedes on the flow of traffic." Mr Khoury added that: "Drivers should enter the roundabout when it is safe to do so." The rule is the same for all states and territories in Australia and carries some pretty heavy penalties for those who ignore it. 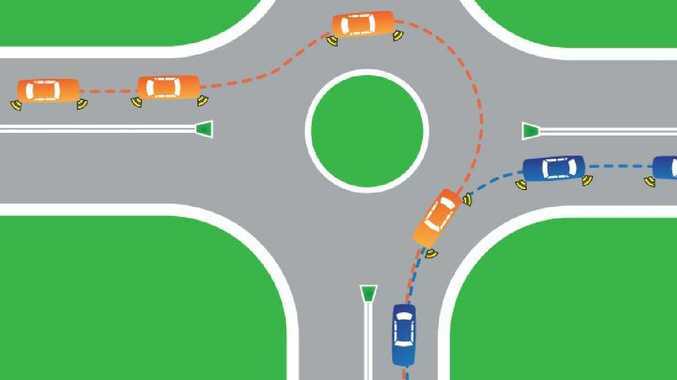 Drivers in NSW will cop a $330 fine and three demerit points if they fail to give way to a vehicle that is already on a roundabout. Those caught in Queensland will be slapped with a slightly higher fine of $378 and three demerit points. It will cost you $159 in Victoria and Tasmania if you fail to properly give way on a roundabout, with drivers also given three demerit points in the latter state. Western Australia is the state with the lowest fine for this offence, with drivers risking $150 and three demerit points for breaking this rule. Motorists in the ACT will also cop a penalty of three demerit points as well as a massive $451 fine. South Australia is the second highest fine with $419 and three demerit points. Executive director of the Centre for Road Safety Bernard Carlon told news.com.au that it is important for all road users to understand and follow the rules correctly. "About 40 per cent of serious injury crashes occur at intersections with research indicating roundabouts reduce the incidence and severity of crashes," he said. "Rather than having a head-on collision, roundabouts deflect vehicles. "Everyone should slow down on approach to a roundabout. 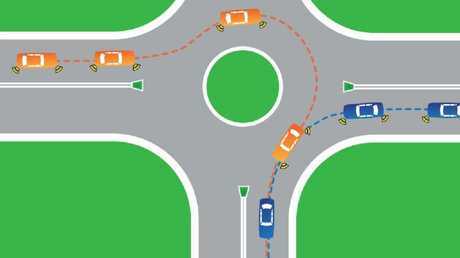 If you are using a roundabout make sure you use your indicators so other drivers know where you are exiting." Unnecessarily waiting for cars on your right could disrupt the flow of traffic. Who to give way to on roundabouts isn't the only road rule confusing drivers, when and how to use a cars fog lights can also become an issue. There are a few options when it comes to car lights - regular headlights, high beams, fog lights and daytime running lights - so it isn't surprising that drivers get them muddled up from time to time. But if you use your fog lights under the wrong conditions you could cop a fine of up to $230. Front and rear fog lights are made to be used in foggy or rainy conditions when a driver's vision may be limited. Front fog lights are mounted low down on the vehicle, and are angled down at a steeper angle than normal headlights. They emit a flat horizontal beam that reduces the amount of light reflecting back off the fog allowing for better visibility. But if these lights are switched on under normal driving conditions they can be a hazard to other drivers by causing approaching vehicles to be temporarily blinded by the lights. They can also lead to rear-end accidents due to drivers mistaking the bright red rear fog lights for brake lights. 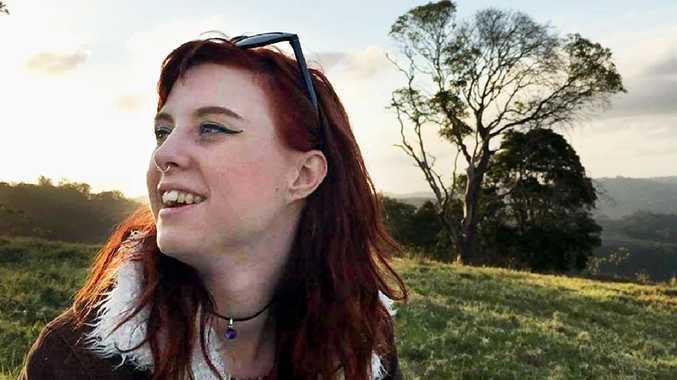 "In NSW a driver is only permitted to use fog lights if driving in fog, mist or other atmospheric conditions that restrict visibility," a NSW Transport spokesman told news.com.au. "It is important to only use fog lights in the appropriate conditions as in normal day-to-day driving they have the potential to dazzle other drivers." News Warwick legend makes the best of a bad situation one year later.